British battleship HMS Royal Oak secured place in the history books as unlikely hero - sunk as a result of one of the most famous naval operations of the World War II. German submarine U-47, commanded by G. Prien, after undetected penetration into the Royal Navy Scapa Flow base, sent her down the bottom of the ocean together with the majority of her crew. This was one of the most painful losses of the British fleet during the war. Royal Oak was one of five class "Revenge” vessels, better known as simple "R”, battleships built throughout the World War I. Amongst her strong sides were very powerful main guns, quite good sailing abilities and interesting, "bulky” profile. "R” battleships have not participated in many of the naval operations of the Great War, as for Royal Oak she took her part in the battle of Jutland. 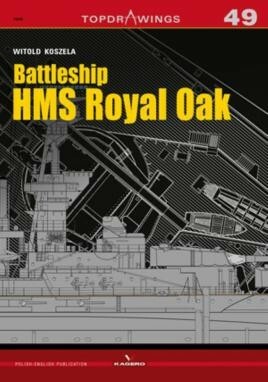 Between the wars HMS Royal Oak was incorporated into the Atlantic Fleet and Home Fleet. She operated on the Mediterranean Sea during the Spanish Civil War. ...another fine set of plans with details that ship modellers will love I am sure. Another complete reference book which will be a real ‘must' for the ship modellers and the armchair admiral alike. This new book comes as a nice addition to the Top Drawings series from Kagero. We still get detailed content inside and it will definitely come in handy for modelers.